Anyone who has ever cherished a dream to go back to the land, raise their own food, and take steps toward self-sufficiency will enjoy this exploration of the authors’ years-long journey down that road. 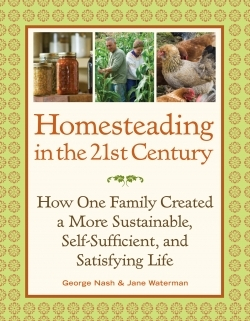 Long-time homesteaders in a variety of locations, they have drawn upon their experiences in a wide range of climates and settings, as well as years of determination and trial-and-error ventures in land restoration, gardening, and animal husbandry, to create a guide that not only explains how to handle the chores that come with a homestead, while anticipating most of a dreamer’s misconceptions about a life spent raising one’s own fruit, vegetables, and livestock. There is a wealth of information between the covers of this beautifully presented book, including appealing color photographs and helpful diagrams; from early warnings not to fall in love with the view from an unsuitable piece of land (“I simply ignored the fact that the stage for my homestead dream was basically a swamp”) to detailed instructions on the needs of fowl intended to produce eggs to the best ways to homestead even on a small urban lot. The neophyte and serious gardener or cook alike will also learn much from the authors’ experiences with farm creatures such as guinea fowl and the ticks and squash beetles that provide them with delectable treats; ways to reduce the use of chemicals and pesticides; and how to store what the land produces. Advice also addresses the adaptation of gardening practices from one climate to another, the advisability and techniques of house restoration, and the options available for waste disposal on an undeveloped site destined to welcome a dream home. Augmented with tables that will help the would-be homesteader determine how much water a well will provide, the amount of produce a garden will yield, and the quantity of firewood needed to replace fossil fuels, the book will be an invaluable companion to anyone serious about becoming more self-sufficient. For those who find the actualities of homesteading too daunting, the authors provide a vicarious adventure as satisfying as any novel.